The main design consideration for the Sport Evolution Impact line presented last year was to create optimal protection for the movement, which would also allow for unrestricted use in terms of sports. Four shock-absorbing elements crafted in elastomer absorb 60 percent of the force of an impact or other external influences. The shock-absorption system provides optimum reliability and rate precision even under the most demanding conditions. Joining the Sport Evolution Impact Chronograph and the 100-piece limited-edition Sport Evolution Impact Tourbillon is yet another strikingly functional and sporty companion: the Sport Evolution Impact Panorama Date. The 46 mm stainless steel case of this robust timekeeper is coated with matt black rubber which, although it does not provide additional protection for the watch, adds a certain flair and aids in creating a harmonious overall design. 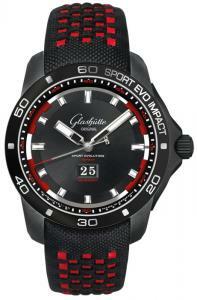 The generously sized Glashütte Original panorama date clearly stands out from the black background at 6 o’clock. This patented function of the Saxon watch manufactory comprises a small disk containing the numerals 0 to 3 in the center of another disk printed with the numerals 0 to 9. This arrangement has the advantage that both disk surfaces are placed on one level, avoiding a “step” in the date display. For this reason, the date window does not need a mullion. The course of the individual hours is shown by polished silver hour markers. The markers are inlaid with SuperLumiNova to guarantee improved legibility, and the centrally positioned sweep hands provide information on the hour and minute, the visuals of which are also strengthened by luminous substance. 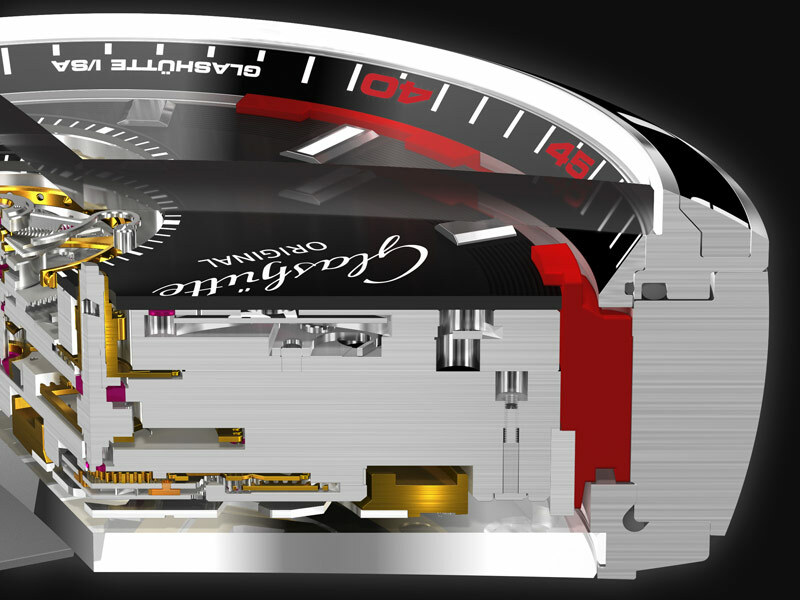 The scratch-resistant sapphire crystal case back provides a clear view of automatic manufacture Caliber 39-47 beating the timepiece’s rhythm. Thanks to a power reserve of 40 hours (+/- 10%), this functional timekeeper provides reliable service regardless of the wearer’s sporting pleasure. 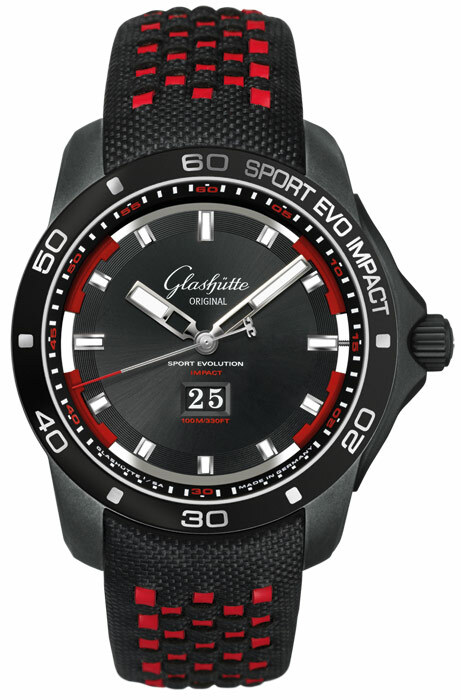 The powerful design of the Sport Evolution Impact Panorama Date continues in the straps and bracelets it can be attached to. This striking timepiece is available on a rubber strap, a woven Trieste strap, or a specially designed stainless steel bracelet. The flawlessly crafted four-link metal bracelet fits the wrist circumference of its wearer perfectly. Adjusting the individual length of the bracelet using the patented, innovative closing and adjusting mechanism designed just for Glashütte Original is easy. The integrated double G logo functions as both the clasp’s button and the activator for the fine adjustment mechanism, which can be adjusted a total of eight millimeters in eight steps, making it supremely comfortable. The elements are screwed to one another with no room for interplay between them so that they are much more stable than links joined by pins. The double security mechanism with two buttons on either side hinders an accidental opening of the clasp.